Editor’s note: Yes, there are sharks swimming wild in New York City’s open waters! It took tremendous discipline to hold back this fantabulous Nature Community item by Paul Sieswerda, animal curator of the New York Aquarium (and a rare fellow Frisian New Yorker). But now you have it, for the first weekend of NYC’s public beach swimming season! One sad note is that in the time between his writing and today, the aquarium’s longest-lived shark passed away. 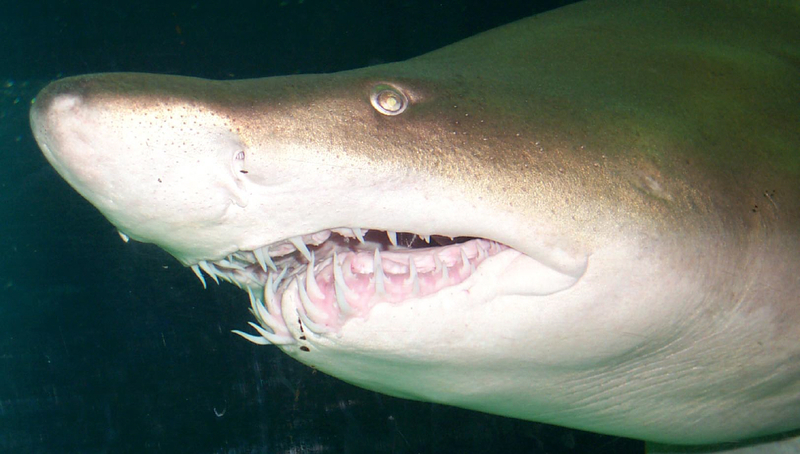 Bertha, a sand tiger shark photographed here by J.L. Maher of the Wildlife Conservation Society, was caught off the coast of Coney Island and lived at the aquarium for 43 years. Her species is so common in the New York Bight that the aquarium has traded young ones for others species from around the world. I had a kayaking encounter with another species of shark near the Narrows a few years back, but that tale will wait for another day. As Curator at a public aquarium, I am often above, in, or under the ocean’s surface and I think that I’m not alone in having brief shivers when the thought of what sea creatures may be eying my activities passes through my mind. It’s just a flash of trepidation and doesn’t slow me down, but I have to admit to it. Sharks, of course, are prominent on that list of imagery and probably somewhat realistic in tropical waters. But in New York? You’re right, that’s crazy. The Chamber of Commerce may not like to publicize it, but the waters around New York are full of sharks. Fortunately, the species are not man-eaters or dangerous, but sharks are plentiful and varied. It should be stated however, that one of the most horrific episodes in shark attack history took place very close by. In 1916, four fatal attacks took place along the New Jersey coast within the first twelve days of July, in Beach Haven and Spring Lake, and miles inland, in Matawan Creek. Another victim was also attacked in Matawan, but survived with the loss of a leg. That history changed the world’s image of sharks when Peter Benchley popularized the factual story in the book, Jaws. Of course, the movie seared the fear of shark attacks further into the psyche of a worldwide population. The fishing fleet off Montauk catches enough monster sharks to keep the impression in the back of most New Yorkers’ minds. However, experience settles those fears for New York swimmers since the chance of a shark attack ranks about in the same neighborhood as the risks as from asteroids. Our native sharks are benign to humans. Local species are fish eaters like the sand tiger shark or scavengers like the smooth dogfish. There are sandbar sharks as well cruising off Coney Island beach. These sharks are happy to hunt fish and leave humans completely alone. In fact, sand tiger sharks and sand bar sharks rarely take bait from fishermen, so they are not often caught on hook and line. The dogfish are another story, and many striper fishermen are disappointed to pull in a dogfish instead of a fat striper. 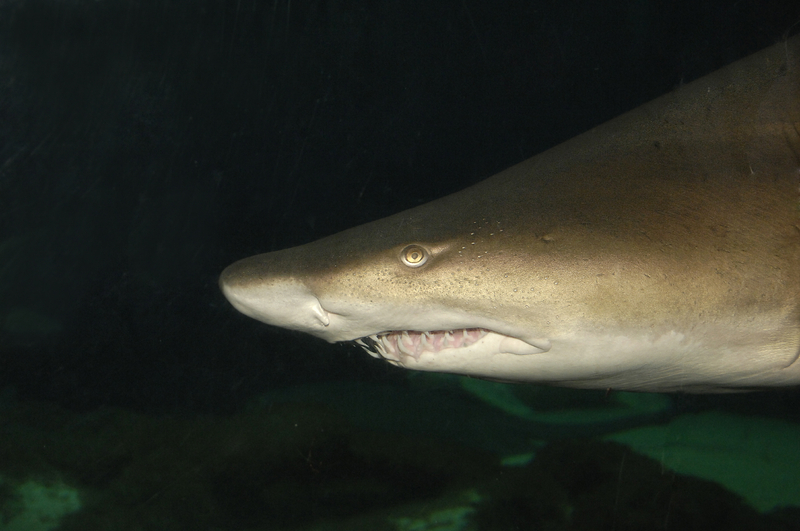 The New York Aquarium has a number of sand tiger sharks on display. One specimen lived in the collection over 40 years. How long do they live? The shark in the photo, Bertha, was the longest living shark recorded at an aquarium and it was probably a couple of years old when it was captured. Since then, the Aquarium has supplied itself and other institutions with sand tiger sharks. Local fishermen catch them in their nets and notify the Aquarium. Since these sharks are usually small they can be transported fairly easily. Some have been sent as far away as Japan. A “pupping” ground seems to be along the southern coast of Long Island. Young sand tigers are caught each year incidental to the fishermen’s target species. Sand tigers have a strange method of development. The embryos practice hunting within the mother! This cannibalism before birth is called oophagy. These teeth, however, indicate that they are fish eaters and not prone to take bites out of large animals (species that do are a real danger to humans). Although they look ferocious, sand tigers have adapted a mouthful of fangs that are designed to effectively grasp slippery fish. Most sharks must continually swim at a speed that gives them lift, but sand tigers are able to keep from sinking by holding a gulp of surface air internally, allowing them to cruise at slow speed and save energy for quick lunges that catch their prey unaware. In aquariums, it was found that sand tigers needed a minimum depth in their tanks, not for any space requirement, but to allow them enough distance to launch themselves above the surface to gulp air. Most New Yorkers will not see sand tiger sharks except at the New York Aquarium, but it may be interesting to know that when gazing out from a Brooklyn or Long Island beach, or even sharing the surf, there are sizeable sharks out there playing out their lives, with little threat to people and deserving only the slightest twinge of fear. Knowing the facts is comforting, but I think it’s human to worry a little. A Better Day for Eggs. Winter Flounder, that is. Easter eggs are hunted in “Eggstravaganzas” and “Eggstreme” events across the city, from the Bronx Zoo to the Queens Zoo, and south to the Leon Kaiser Playground in Brooklyn and the West Brighton Zoo on Staten Island. But the best-hidden eggs in the very center of Gotham right now may be those laid by Winter Flounder. 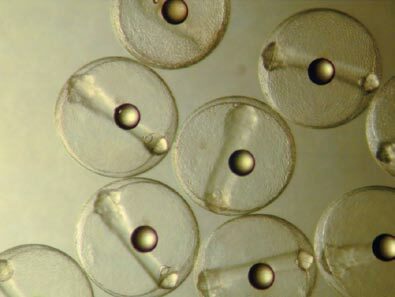 The mighty machinery of our industrial port city has been stayed so that the roughly million tiny eggs (the fertilized flounder eggs magnified in the photo above are from a Virginia Institute of Technology laboratory) dropped by each mature female can be deposited right on the sandy substrate, and incubate undisturbed for two or three weeks. “From February first through the end of May for the past several years we’ve suspended dredging the shipping channels where the eggs are laid,” said William Slezak, Chief of the Harbor Operations Branch of the U.S. Army Corps of engineers. Winter flounder prefer sheltered shallows with cool water, such as you’ll find in the kills (Dutch for creek, a linguistic colonial legacy) surrounding Staten Island, Newark Bay (a main commercial hub of the mid-Atlantic region), Jamaica Bay, and Raritan Bay. That surprising deference to a not-so-pretty bottom feeder reflects not only how far natural resources public policy has come hereabouts, but how dire the winter flounder crisis has become. The species is clearly sensitive to warmth; when water temperatures cross 73 degrees Fahrenheit (23C) they bury themselves in muddy bottoms and wait out the heat wave. A few degrees more and they are dead. Also, as Waldman pointed out, a change in water temperatures could disrupt previously reliable detritus-based food production at the microbial level before it can rain down to the flounders below. As for all those “hungry mouths,” winter flounder certainly remain prized by local anglers, including those in New Jersey ready at this very moment to sneak out from family gatherings to hook them; fishing season for the species begins today. But natural predators, often themselves benefitting from government protection, are removing much more winter flounder, both in terms of numbers and biomass. Species like striped bass, bluefish, summer flounder and fluke, and even seals in the Gateway National Recreation Area, are feasting on winter flounder. Cormorants are a new arrival to our estuary, having expanded their range north. These extraordinarily effective fishing birds put greater pressure on an already stretched resource. Winter flounder are particularly susceptible to pollution (Grosslein and Azarovitz 1982). The eggs are laid directly on the substrate and therefore any toxins in the sediment can affect their viability. This species’ close association with the benthos also potentially exposes the fish to sediment toxins. Grosslein and Azarovitz (1982) noted that few larvae survived in polluted estuaries, and that winter flounder were entirely absent from polluted sections of NY/NJ Harbor. In particular, winter flounder experience increased mortality as a result of exposure to insecticides, especially DDT (Buckley 1989). But now, while winter flounders are scarcer than ever, their re-colonization of our bays and inlets testifies to a cleaner and healthier estuary. Yeah, but just try to get a flounder to see any situation from both sides.